For the past year I have been collaborating with Paul Amitai (Eyebeam), Jason Jones & Beka Economopoulos (Not An Alternative) and Marco Desiris (Snafu) on a talk series as a part of Upgrade NY. The series revolved around open source as it relates to activism and creative practice. 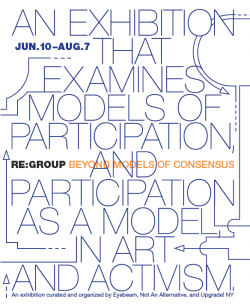 Yesterday we opened an exhibition on this theme, investigating models of participation and participation as a model. The show features 13 works from a long list of artists and art collectives. The collaborative process of developing the show was quite fascinating (though sometimes excruciating) on its own. This process reached its climax when we had a really hard time arriving to a consensus on the curatorial statement. Things got pretty emotional as each side felt subsumed by the other in a futile attempt to find the middle ground. In the core of the disagreement was an intellectual argument Jason and I have been (really) enjoying for the past three years. If we have not reached an agreement for three years, a three days deadline was not enough to change it. Finally we realized that in the rush to come up with a uniform statement we have not internalized the tagline we chose for the show and go “beyond consensus”. We decided to publish an introduction followed by two curatorial statements. For the past year Eyebeam and Not An Alternative have organized the NY node of Upgrade!, with the theme Open Source in Activist and Creative Practice. The decision to produce this show was born from that collaboration, however the curatorial concept was a source of constant debate. A unified position was never achieved, but collaboration does not necessarily result in synthesis. 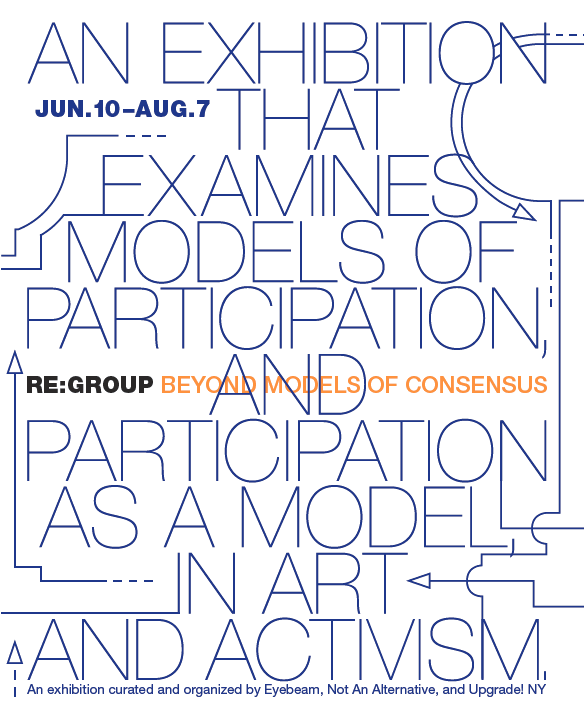 The intention with the following two curatorial statements is to reflect subtle but important differences in our curatorial perspectives on the subjects of collaboration and participation. As we reflect back on the process of curating this show we see that our experience was far richer because of the (albeit sometimes painful) philosophical, aesthetic, and political debates among us. While harmonious unanimity was never achieved, in our view this must not be seen as an inevitable goal. We appreciate that in this show about collaboration, our curatorial collaboration has honored distinct positions, rather than subsuming difference in pursuit of consensus. This time the Upgrade event will attempt to take on the dark desires beyond the basic art/privacy/surveillance discourse. Through three projects exercising different modes of surveillance we will discuss artists jealousy of authoritative powers and the desire to posses these powers themselves. This is a live online theater piece that uses surveillance cameras as a playing space for actors and audience members as you become part of a security team policing the streets of New York. devised and developed by: Ryan Holsopple and Mirit Tal. Little Feet Bureau International brings privatization to government surveillance. Four dot-matrix printers comb internet traffic. Upon finding words that threatens a client nation, the machines use the intercepted “evidence” to draft letters accusing and questioning the offenders. Obsessed with uncovering secrets, the final product of the system is a culture of paranoia. As such, the installation stands with one little foot planted in hysterical paranoia and conspiracy theory and the other in denial and the claim “it can’t happen to me”. Little Feet are: David Nolen, Toshiaki Ozawa and Mushon Zer-Aviv.